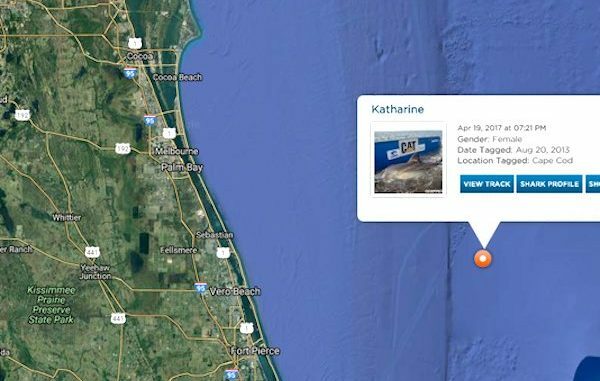 VERO BEACH – Katharine, a great white shark, has made another visit east of Vero Beach and Sebastian Wednesday night at 7:21 p.m.
Vero Beach residents began watching her movement on the OCEARCH website last night. Katarine is female great white shark that is over 14 feet long and weighs 2,300 pounds. She was first tagged by OCEARCH on Aug. 20, 2013. OCEARCH can ping Katharine whenever her dorsal fin breaks the surface of the ocean water. The fin then sends a signal to a satellite, which allows her to be tracked online. The shark appeared off Fort Pierce in February and spending several days off the coast of Brevard County in January. Katharine first pinged offshore of the Sebastian Inlet on May 12, 2014. She swam about a quarter-mile off the beach near an area in the waters called The Monster Hole. About 24 hours later, she was swimming near the St. Lucie Inlet. The great white pinged again along the Florida Keys before swimming for warmer water in the Gulf of Mexico. Katharine has a lot of fans in Indian River County, and residents in Sebastian and Vero Beach track her moves whenever she comes close to the Inlet.